Our products for the home range from tableware including plates, bowls, mugs, and serving items, to kitchen essentials such as spoon rests, trivets, and our line of Texas themed aprons, oven mitts, and dish towels. We offer pillows and throws for the comfortable Texas home, and a distinctive line of wine and bar accessories. Give the customer-favorite Capitol Candy Jar as a special gift to those who love the Capitol as the center of the Austin skyline. 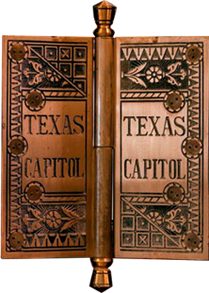 Find handsome desk accessories for your office, including our popular State Seal clock and executive pen set in jade tinted glass, plus paperweights, magnets, and other note pads and stationery featuring Texas wildflowers, the State Seal, and the Capitol.